Can you show me that on the map? OK, first reason - it doesn't exist anymore - it became a part of the M53 in 1981. It's the part between just west of junction 5 along to junction 10. Here's a map showing it as M531. What? Unclassified? You mean like a residential street? That's crazy. So, it went from an unclassified road, to a motorway? No. It became an A-class road, the A5032. Hey, I didn't make this up you know! OK, here's a map showing it as an unclassified road. Can I see any photos? There's some in the M53 photo gallery. When the first part of what was to be come the M531 was built in 1966 I was 12 and living in Ellesmere Port, the motorway contruction site made a great playground. I'm not so sure it did open as an unclassified road as is shown on the map though. Indeed the area to the north of the GSJ had long before stopped being "Hooton Park" and had become the Vauxhall car plant which of course is why they built that bit of the road first. John Davies comes back with some more! What's stated is correct. An unclassified road became the A50something then the M531 and then the M53 which it is today. I took my driving test in Ellesmere Port in 1968 and Hooton Industrial Road was by far the quickest way into EP from Eastham. It can get busy at rush hour and at the weekend with shoppers visitng and leaving The Outlet Village. "The photograph on your M531 page looks a little suspect. The "1" looks like it has been added onto the sign, while there is a dubious "1"-shaped gap on the M53 sign! Having said all that, this is related to one of my favourite pathetic/unbuilt motorways. There is a junction on the A55 at Ewloe which is heinously over-engineered (you have to turn off the A55 to stay on it, in both directions - an indication that something else was intended that never actually materialised), and my assumption is that the original planned M53 would have joined the A55 at this point. I'd love to know if anything official confirms this theory of mine." I'm not sure that the M53 would have ended up at Ewloe. I think the reason for the odd junction there is that originally the main route was supposed to be from the end of the M56 via Queensferry to that junction so you would have been on the main-line at it. Because of the congestion at Queensferry most folk turned down the M53 and then went arount the Chester by-pass. One reason they upgraded the bit at the end of the M53. The best route now would be to use the Lower Dee crossing if only they would put in the missing link from the junction near Flint to the A55! In your map of the unclassified HIR you will see that the south east end degenerates into a straight road (North Road) with a level crossing of the Manchester Ship Canal Railway. 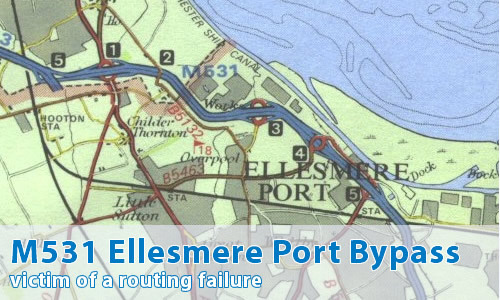 This route from Ellesmere Port used to have a bus route and there was a bus stop sign alongside what became the northbound hard shoulder until the section between M53 J7 and M53 J8 was resurfaced in the early 1990s! In the southbound direction there was a redundant Give Way sign located behind the advanced sign for J8. The post is still there although the sign face has now disappeared. I remember the M531 sign into the early 90s at the Rossmore junction. The A55/A494 junction was somehow going to be linked with the M53 at Jnc5 via Queensferry, hence the drop, north bound and the bridge from the south bound (removed in the last 10 years), unsure how true that is.